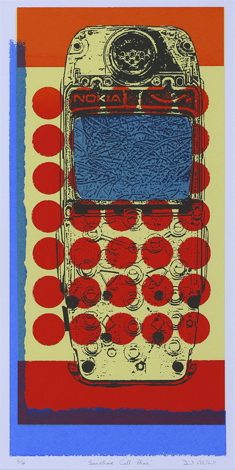 Screenprints are made using stencils applied to stretched mesh screens, through which ink is squeegeed onto the paper. Colours are built up layer upon layer to produce a print of bold graphic effect. Stencils can be made very simply using paper. Elaborate photographic images can also be used to create stencils. In this case a photo emulsion coating is applied to the mesh and left to dry. The screen is then exposed to UV. Where the black lines of the art work block the UV the areas are uncured and can then be washed away leaving a stencil to print through. The techniques I use can be found in the book ‘Screenprinting, The complete water-based system’ by Robert Adam and Carol Robertson. The book ‘Waterbased Screenprinting’ by Steve Hoskins is also very useful. ‘Sea Shore Cell Phone’ Limited edition 1/14. This very battered Nokia has lost its number cover revealing the rubber pads beneath. The circular microphone area at the top has a very retro walkie-talkie feel. A good find on a trip to the beach. The colours were printed using paper stencils, whilst the phone was a photographic image transferred to the screen using photo emulsion techniques and a UV lightbox. The same image printed onto glass can be found in the Contemporary Glass section via the ‘Gallery’ area. This image was printed in reverse on the back of the glass so when viewed through the glass it would read the right way around. The ink used was a vitreous pigment mixed with a screen printing medium. Using a glass kiln the ink was fired into the glass. In the way the image is sunk just below the surface, making it indelible, it is similar to a tattoo. 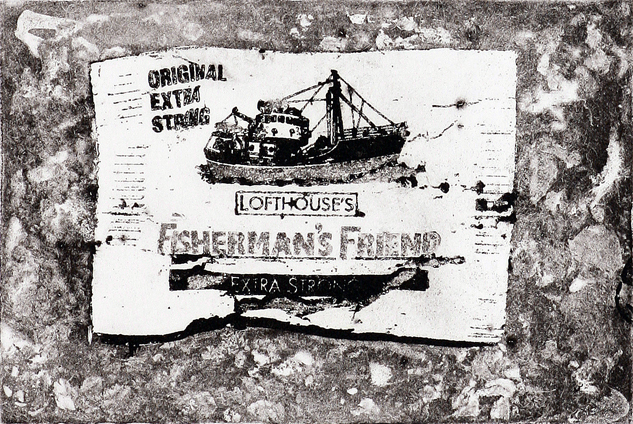 Etching is a more widely known printing technique. I use acrylic resist etching (ARE) techniques. This replaces the old wax/varnish resists with modern user friendly acrylic versions. The principle is the same though. A metal plate, in my case copper is coated with a resist which I then draw into using a variety of tools, exposing the metal to be etched. The acid creates recessed lines which when inked up will produce a print range from stridently bold to ephemerally delicate. Tones are created by the density of lines and cross hatching techniques. Aquatint gives me tonal effects and is used hand in hand with etching. An aquatint using ARE is achieved by spraying a fine acrylic mist onto the plate using an airbrush. A ‘peak linen style’ folding magnifier is used to examine the fine dot coating on the surface of the plate. The dots want to leave a satin finish 50/50 glint of metal/resist. The acid bites through the fine mesh of dots in timed stages, stop-out resist is applied to areas as they reach the desired tone, this protects them from further bite. The tones are predicted by referencing a previously printed guide made from a timed stage bitten aquatinted plate. The longer the metal is exposed to the acid the darker the tone.These elaborate techniques become in time second nature and help create the special atmosphere associated with the medium. The photo-resists I use are applied as a UV light sensitive film adhered to the copper plate. This is then exposed to UV light. Half the exposure time is given to the aquatint screen (to achieve tonal variation) and half to the image positive acetate. The positive image can be created by drawing and painting directly onto plastic sheet or a photographic image printed onto acetate. Combining these two techniques produces strong results. I create an image on acetate/plastic sheet that blocks the UV light from hardening the photopolymer film beneath. The exposed areas are cured by the UV creating a tough acrylic resist . When developed in a bath of dilute caustic soda the unhardened coating lifts away exposing the metal.The exposed metal can then be bitten by the acid to create the printing plate. The ARE techniques outlined above are explained in depth, step by step in the excellent Thames and Hudson book ‘Intaglio’ by Robert Adam and Carol Robertson. Monotypes are made using a blank bevel edged printing plate to which I apply an oil based printing ink by rolling, painting, drawing and sponging on the surface. This extensive additive/subtractive process continues until the image begins to emerge and can then be refined to the point at which I am ready to print. The plate is then run through an etching press at slightly less pressure than taking a print from an etched plate. This is due to the dampened paper lifting the ink from the surface rather than from the recesses of an etched plate. Once through the press the blankets are rolled back, tissue lifted away and the printing paper peeled up to reveal the print. A dramatic moment of truth, has the print been realised? The technique of monotyping as the name implies is a printing process of which only 1 print may be produced. There is no going back to try again, these prints are truly limited (1/1). 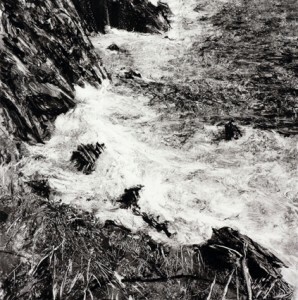 The monotype depicted below is entitled ‘Crashing Waves’. It is a view from the coast between Port Grenaugh and Santon Gorge on the Island. In the show I have produced several monotypes from this beautiful stretch of coastline. 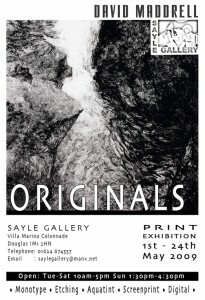 First of a set of posts about the show I am having at the Sayle Gallery in Douglas. The exhibition is the first solo show I have had since my residency days at the Courtyard gallery 2001-2. It is also the first time I have had a major show, 51 works, entirely comprised of original prints. 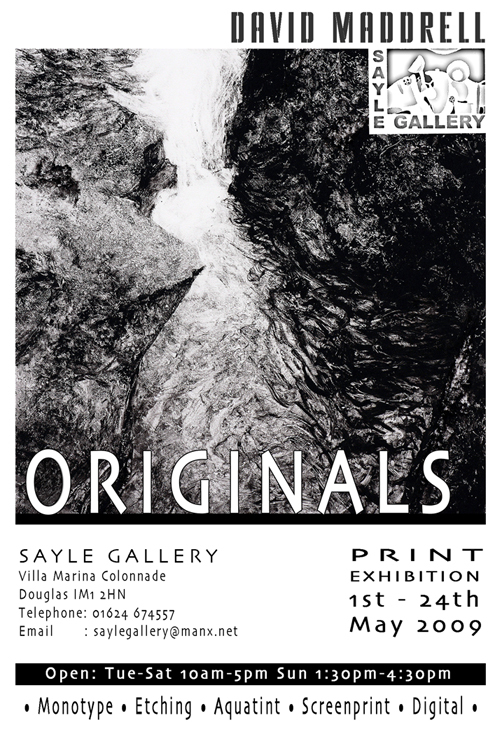 The term “original print” denotes a print work created within a particular printing medium; as opposed to a reproduction which is a facsimile work initially created in a non print based medium. In this body of work five different print mediums are used to create the pieces, Monotype, Etching, Aquatint, Screen print and Digital. You are currently browsing the David Maddrell weblog archives for April, 2009.